With the beginning of 2013 looming I am sure many of you have been working on your marketing campaigns and planning how you want your 2013 to play out. But have you sat yourself down in front of the mirror and asked yourself "is my approach to program design where it needs to be, or do I need a makeover?" Keep in mind our industry has evolved since each one of us began our careers, and it continues to evolve. The question then becomes "does/did the science change and how should our approach change?" We must also take into account the expectations of our clients have been changing. Due to the internet, clients are generally more informed and educated. For example, they come in expecting us to be able to identify muscle imbalances and to correct them. In order to meet the goals, needs and demands of each person that will walk through our doors we must have a solid understanding and complete mastery of the Nine Governing Principles of Exercise Science. These principles provide the scientific rational for personal training, strength and conditioning, physical therapy, sports medicine, etc. The above nine principles are manipulated by the following nine acute variables to change the neuromuscular stimulus (input) in order to achieve a specific and desired outcome from our training programs. Keep in mind there are more than nine acute variables but these nine are often the most commonly manipulated. 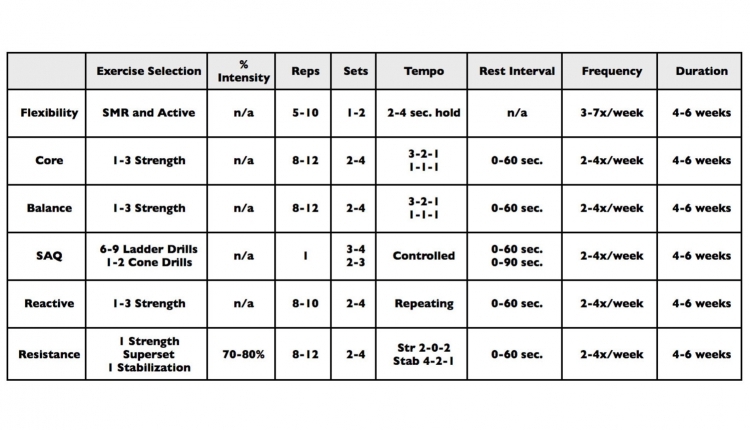 One of the best ways to incorporate the nine principles of exercise science and their corresponding acute variables into program design is to use the (5-Phase) Optimum Performance Training Model (OPT) from NASM. It is a great way to periodize the first few months of your clients training sessions. With each phase the goals change as well as the acute variables. By constantly changing the acute variables the neuromuscular stimulus is also changed and plateau periods are either eliminated or greatly reduced. Once a client has been through the appropriate phases it is often best for them go into an undulating periodization format. This allows and accounts for the rapid fluctuations (work, stress, missed sessions, etc.) in the lives of our general population clientele. When working with professional athletes a linear periodization model is often easier to attain as their lives are already structured into different time periods (pre, season, post, off, etc.). Phase 1: In the Stabilization Endurance Phase the goal is to improve muscular endurance, enhance joint stability, increase flexibility, enhance control of posture and improve neuromuscular efficiency. Phase 2: The Strength Endurance Phase focuses on improving stabilization and prime mover strength, improving overall work capacity, enhancing joint stabilization and increasing lean body mass. Phase 3: In the Hypertrophy Phase the goal is to achieve maximal muscle growth through individual muscle cell hypertrophy. Phase 4: In Maximal Strength Training the goal is to increase motor unit recruitment, increase the frequency of motor unit recruitment, and improve peak force production. Phase 5: In Power Training, the goal is to enhance neuromuscular efficiency, enhance prime mover strength, increase rate of force production, and enhance speed strength. Through the utilization of the nine governing principles, acute variables, and the five phases of the OPT Model we can ensure our clients expectations are met in a systematic, progressive, and time efficient manner.